As companies grow, they often wind up scattered across multiple office buildings around town before eventually deciding it’s more efficient to consolidate at a single facility. That move can be a clean-slate opportunity to develop their ideal AV strategy. It was for Mediacom Communications, which provides cable TV, broadband, and phone services in 22 states. In September 2013, Mediacom opened a 110,000-square-foot headquarters in Blooming Grove, New York, located southwest of Newburgh. The new HQ replaced four rented facilities. The new AV systems include IP video surveillance. The company chose Genetec’s solution, whose forensic capabilities include the ability to tag someone and then have the system find footage where that person appears. 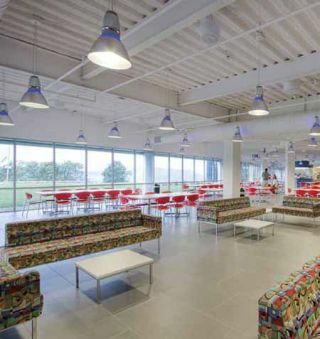 The new Mediacom headquarters in New York State features top-shelf AV systems, including an immersive videoconferencing suite, extensive digital signage network, and an IP video surveillance system. The IP system incorporates HD cameras, some of which have microphones. Mediacom Founder, Chairman and CEO Rocco Commisso, wanted the AV designed to ensure maximum flexibility, now and in the long-term. “We’re really reaping the benefits of that now,” Lyons said. “We can harness just about any kind of meeting or presentation that people can come up with.” “Any other camera that can see that person will automatically pop up on my screen and follow that subject in playback,” said Peter Lyons, Mediacom group vice president for IT. “I can start following that person in my parking lot, and then every path in the building they take until I tell it to stop. All of Mediacom’s cameras are low lux, which is valuable for places with low lighting, such as the data center, where lights typically are off. “Low lux capability is key for being able to pull up non-grainy images,” Lyons said. The cameras also are HD, which Lyons says is money well spent. The system records at a relatively high 30 frames per second, which further helps discern identifying details such as facial features. “I’ve found that HD cameras, although a little more costly up front, address a number of the issues: not only low light, but also the ability to capture a good image, whether that be in an elevator, outside or in a dark hallway,” Lyons said. Some of Mediacom’s cameras have microphones for additional insights into what’s going on in a particular spot. The lobby also is home to part of Mediacom’s digital signage network. Three displays arranged on a column in portrait mode each face different directions with different content for different types of people. The one facing the main entrance welcomes guests. Another faces the couches so waiting visitors have live TV and other content to pass the time. A third faces the elevators to provide employees with internal information such as benefit signup reminders. The lobby also is home to part of Mediacom’s impressive digital signage network. When companies deploy a signage network, they’re often overwhelmed by the day-to-day task of creating and managing content. A plan for keeping up is key for maximizing the network’s ROI because if employees or customers see outdated content, the signage loses its effectiveness. Mediacom avoids that problem by using Four Winds Interactive’s solution for its entire signage network, including 20 customer service contact centers around the country. The Four Winds platform also uses XML to interface with internal Mediacom systems to get updated information every 15 to 30 seconds. That automation avoids both the problem of stale content and the expense of dedicated staff for managing it. For example, if customer call volumes spike to a predetermined threshold, the contact center signage starts highlighting it with color to attract attention. Mediacom made AV part of the discussion early on in the project. That avoided the problems and expensive changes later on—such as sunlight overpowering displays— that are common in corporate projects where AV isn’t considered until well after construction has begun. “Fortunately I was at the table before the foundation was poured,” Lyons said. “Every conference room that has outside lighting was preplanned with Mecho shades. That helps cut it down considerably. Mediacom also knew when it made sense to cobble together something internally rather than buying an off-the-shelf solution. “The Mecho shades have a robust but rather expensive enhancement to the platform that allows you to put sensors on the roof, both sunlight and temperature, and determine the angles of sun and the impact on the zones where you have shades,” Lyons said. Instead of roof sensors, Mediacom’s own system polls time-of-day tables on the Internet. That tells the system when to lower the shades in rooms that the scheduling system says are about to have meetings. AV also got a boost from Mediacom Founder, Chairman and CEO Rocco Commisso, who wanted everything designed to ensure maximum flexibility. The new headquarters has an immersive videoconferencing suite, with a second one under construction at the company’s Des Moines facility. There’s also a training facility that can be used for town hall-style meetings. It recently was used to host a member meeting for CableLabs, a trade association, with some presentations coming in from CableLabs’ Denver office, and everything going out to nine Mediacom sites. Like many enterprises, Mediacom has expanded videoconferencing out of suites and executive offices so more employees can benefit from it. For example, Lyons has staff in seven locations who participate using videoconferencing software on their iPads and iPhones. “One reason we did that is because I didn’t want people to have excuses: ‘Oh, I can’t join because I don’t have a conference room,’” Lyons said. Mediacom’s COO holds his weekly staff meetings completely over video, which the company also now uses for job interviews. For example, a candidate who lives near the Des Moines office can go there for a video interview with staff at headquarters. If a candidate doesn’t live near any Mediacom office, the company can push a secure desktop client out to that person’s laptop or tablet to facilitate the interview. “Those have worked extremely well and have saved us money on transportation,” Lyons said. Mediacom originally used Polycom videoconferencing, but switched to Cisco because it already buys so much Cisco IT and telecom gear for its customer-facing services. That gives Mediacom more purchasing power on the videoconferencing side. “It made a lot of sense economically for me to take a hard look at their suite,” Lyons said. One challenge with a new headquarters is identifying all of the available AV options and then picking the right ones. Getting advice from AV pros is one way to reduce that process’ time and stress. “I interviewed a number of AV architect and design firms that I kind of brought along for the ride as my copilot to understand our requirements and translate them into solutions offerings from various vendors,” Lyons said. Mediacom continues to use them, such as for designing the new videowall in Des Moines.